Sangha by Octave is a holistic wellness sanctuary, covering an area of approximately 189,000 square meters. It is located beside the beautiful Yangcheng Lake, Suzhou, and adjacent to the ancient Chongyuan Temple. Sangha by Octave combines the Chinese and Western approaches towards a mindful way of living, and aims to provide a space of serenity where we can immerse our body and soul in the embrace of nature, and eventually to rebuild a harmonious unity between one’s inner self and the outer environment. Sangha by Octave comprises three major sections: AT ONE, THE VILLAGE, and SANGHA HOMES. During a stay in AT ONE, the team will provide guests with a body-mind assessment and evaluation, led by an international team of medical doctors and healing experts, followed by a professional customized healing plan. Here, guests can relish long-term or short-term wellness programs, a magic experience of the healing SPA, enhancement of health awareness, and enjoy Ayurvedic and TCM treatments, lakeside yoga, sound healing and many other unique treatments and services. THE VILLAGE, Sangha’s Interactive Learning Community Area, provides a comprehensively versatile community space for purposeful learning and living. It provides a one-stop service for large-scale corporate activities, such as corporate interactive communications, seminars & learning, team building, corporate annual parties, community celebrations, festivities and learning events. Last but not least, SANGHA HOMES constitutes 108 lakeside villas, which can be purchased as private residences to fully adapt an entire well-being life journey with Octave living philosophies, or used as a high-end corporate club suitable for the purpose of conference meetings. 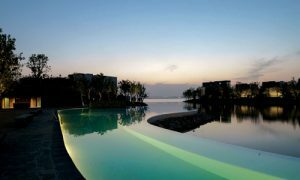 Enjoy the breathtaking Yangcheng Lake views and environment while having the assurance that the best of medical and lifestyle support are right at your doorstep; such amenities in one setting is priceless and not found in other communities.